The woodlands of the Cairngorms are of national and international importance because they contain the largest remaining areas of semi-natural woodland habitats in Britain! 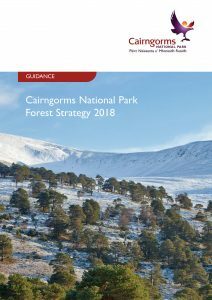 The Cairngorms National Park Forest Strategy 2018 is the key document providing strategic direction on future forest management and the restoration of woodlands in the Cairngorms National Park over the next two decades. It helps to ensure that future forestry activity is directed to where it matters most and that other important habitats and activities such as the management of farms, moorland, wetland and recreational resources also benefit. promote awareness of the value of encouraging more woodland creation in the Cairngorms National Park and encourage greater collaboration between agencies, the forest industry, landowners, land managers and communities.